Rapid Set | Pro Chem, Inc. 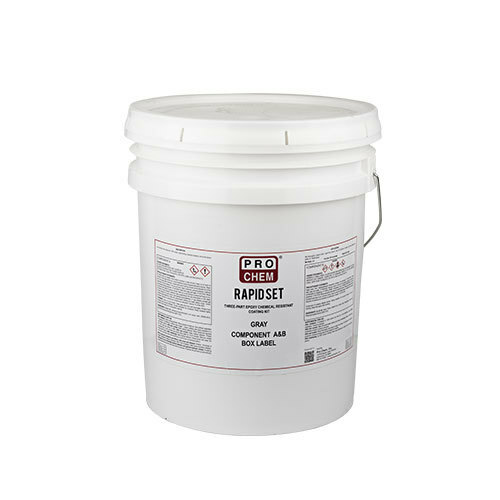 RAPID SET is a low temperature application, two-component structural epoxy. It is designed to be mixed with graded sands for resurfacing at low temperatures (down to 35ºF) or for repairs and resurfacing where time is of the essence at higher temperatures. It will cure to yield a hard, dense abrasion resistant surface at 35°F. *Above 60°F, areas may be opened to traffic in as little as 2 hours after applying. This epoxy is formulated to be applied when the temperature is cold or at normal temperatures when cure time needs to be greatly reduced. Please note that at higher temperatures the mixture will set up at a much faster rate, and the mixture will have to be applied to the floor very quickly. Mix thoroughly 2 parts by volume of Part A and 1 part by volume of Part B. Prepare the mortar system by adding 3 – 3 ½ gallons of clean, dry sand to each gallon of epoxy mix. Blend the epoxy and sand until the mixture is uniform. *Pot life is 10 minutes at 70°F. Do not mix more than can be applied in 10 minutes @70°F or 20 minutes @50°F. *Note: For all epoxy coatings the standard temperature for application is 75º Fahrenheit. For every 10º Celsius/16 degree Fahrenheit temperature is raised reaction is doubled cutting pot life in half. For every 10º Celsius/16 degree Fahrenheit temperature is lowered reaction is cut in half, doubling pot life.